Queen is the epitome of a feelgood movie, yet it’s substantive and truthful, thanks to the remarkably well-crafted character at its core. Writer-director Vikas Bahl and actress Kangana Ranaut give life to Rani Mehra, a woman whose journey affirms the virtues of courage and an open mind. On the day before her wedding, Rani’s fiance, Vijay (Rajkummar Rao), calls off the marriage. Rani (whose name means “queen”) locks herself in her room, reliving memories of Vijay’s initial courtship. Flashbacks to early romance are commonplace in Hindi films, though they generally don’t advance the story so much as provide a convenient place for a dance number. In the case of Queen, the flashbacks inform the audience as to why Vijay’s abrupt change of heart comes as such a shock to Rani and her family. This period of mourning also establishes what a loving family Rani has. Her mother, father, and younger brother are worried and protective, but they don’t blame her for the breakup or pressure her to reconcile. Rani is finally motivated to act by the words of her very cool grandmother, who encourages her granddaughter to go experience the world, since one never knows what the future holds. Rani decides to go on her dream honeymoon to Paris and Amsterdam, even if she has to go by herself. Rani’s arrival in Paris begins her fish-out-of-water adventure. She experiences all the typical frustrations of traveling in a country where one doesn’t speak the language, including a funny and disastrous attempt at ordering a meal off a French menu. A clever riff on a chase scene involves Rani running in desperation to find someplace in the city without a view of the gargantuan Eiffel Tower, a symbol of her failed relationship. The heroine’s fortunes change when she’s taken under the wing of Vijayalakshmi (Lisa Haydon), an endearingly slutty, half-Indian hotel employee. Vijayalakshmi gives Rani the tools and courage to navigate her new world and introduces her to experiences she would’ve avoided in the past. Ranuat’s performance when Rani finally lets loose at a disco is fierce, funny, and bewitching. Vijayalakshmi embodies one of the movie’s main themes: that there are good people all over the world, from various cultures and living a variety of lifestyles. From Vijayalakshmi, Rani learns that being exposed to new ideas and experimenting with new activities doesn’t compromise one’s identity or morality. One of the delights of Queen is the goodness of all the characters in the film, besides the villainous Vijay. Rani leaves Vijayalakshmi and meets a trio of new friends in Amsterdam — Taka from Japan (played by Jeffrey Chee Eng Ho), Tim from France (Guithob Joseph), and Oleksander from Russia (Mish Boyko) — as well as an emotional Italian chef (Marco Canadea), who pushes Rani to prove something to herself and to the world. The kindness of the supporting characters is important because the primary conflict in Queen is internal. Brief flashbacks throughout the film establish that Rani has been too passive in the past, lacking the determination to do what she wants. Only Vijay takes advantage of this tendency, but the point of Rani’s journey is for her to realize that she’s an individual who deserves to find and follow her own dreams. The international supporting cast is uniformly likable and talented. Haydon stands out, playing the id to Rani’s superego. The costume department deserves kudos for supplying Vijayalakshmi with a flashy, slightly scandalous wardrobe that delights Rani’s father and brother when they catch a glimpse of the new friend via Skype. Kangana Ranuat is at the core of Queen‘s success. She makes Rani into a character that the audience feels like we really know, and someone we would want to know in real life. Her journey ends on such an optimistic note that part of me hopes that Bahl writes a sequel. I want to know what happens to Rani next. 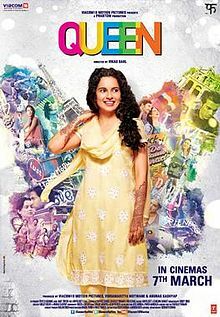 This entry was posted in Reviews and tagged 2014, 4 Stars, Bollywood, Guithob Joseph, Hindi, Indian, Jeffrey Chee Eng Ho, Kangana Ranaut, Lisa Haydon, Marco Canadea, Mish Boyko, Movie Review, Queen, Rajkummar Rao, Vikas Bahl on March 11, 2014 by Kathy. Great review. Makes me want to check out the film. Great review,Kathy.The film totally deserves 4/4 and more,if you ask me. One of the best movies I have ever seen and certainly the best movie this year(Bollywood or Hollywood)! !I am in love. I rooted for Rani like she was my best friend and was protective about her.How often does that happen?I cried,laughed heartily,applauded(with the audience) and had a wide wide grin on my face. The film is a simple tale of a simple girl but yet there were plenty of goose-pimple inducing sequences.Like that scene where she lets her hair loose in the club.Wow! Kangana was outstanding,like you mention ‘Bewitching!! !And a special mention to the magnificent music by Amit trivedi.Kudos to the director and the team.A classic already! I agree with everything you wrote, Anushka. Thanks for pointing out Amit Tridevi’s music, too. The whole score is terrific and perfectly suited to the film. Inspiring film! I loved it. Great review, I agree with every points you mentioned. I was late to watch the movie but now I have already booked tickets for Sunday for second watch. This movie is terrific. One thing I loved about movie is that it doesn’t give us stereotypical characters that bollywood has introduced to us in all these decades. Family doesn’t go blaming her instead they support her decision to explore the world. When she got drunk she doesn’t go crazy and many more. Loved it. Oh my god. That scene is so hilarious. Why to waste a good sweater. 😀 and that when sshe calls her mom to ask about some spice’s name in English and the whole chain of calls starts. 😀 so much attention has given. Loved “Queen”. One of the best acted and directed movies of Bollywood. The way,the story moves is gripping nd does not bore u…..
“Liar’s Dice” is India’s official entry for Oscar this year.Did u get chance to watch it in any film festival? “Margarita,with a straw”,Indian movie featuring Kalki Koechlin has been making great rounds at festivals nowadays.It won Best Asian Film at Cannes and standing ovation at Busan Film Festival too.Waiting for both movies to release soon….